I might be one of the only people on the planet that has not seen The Lion King movie. 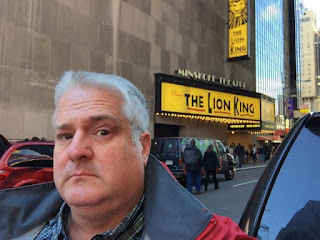 I have seen The Lion King Jr. musical a bunch of times, as my son acted in it this past summer, so at least I am familiar with some of the material. Well, I finally got the see the full stage musical this past weekend at the Minskoff Theatre on Broadway, and I walked away very impressed. The Lion King musical is based on the 1994 film, which is one of the most successful in history with almost a billion dollars in box office sales. The movie featured five songs written by Tim Rice and Elton John, “Circle of Life,” “I Just Can’t Wait to Be King,” “Be Prepared,” Hakuna Matata,” and “Can you Feel the Love Tonight;” all of these carried over to the stage version. You probably know the story, but if not it is a typical hero’s journey of a young lion, Simba, who takes out on his own after the untimely death of his father, later to return and take his rightful place in the world. Fairly predictable, yet satisfying! The musical version of The Lion King debuted in 1997, with a bunch more songs and a few twists to the original plot (or so I have been told, never having actually seen the movie). And it has never closed down – that is an 18-year run on Broadway, making it the third longest running show ever, and it has won 70 major theatre awards. There is also a touring version, and all told over 80 million people have seen this show. Wow! Since 2006, The Lion King has been playing at the 1600-seat Minskoff Theatre at 1515 Broadway in Manhattan. It is a nice theatre with good acoustics and line of sight, though the first few rows are pretty far below stage level, so the folks in the “good” seats will miss parts of the action. The production was really quite amazing, in every respect. The cast was wonderful, which is not surprising as the biggest and best singers and dancers flock to New York with dream of being on Broadway, and this show got the cream of the crop. Young Simba (Jahi Diallo Winston) and Young Nala (K’Lynn Jackman) had amazing stage presence and really delivered the goods. Note that these roles are played by two sets of actors so they doe not have to play every show – that would be a lot to ask of a kid. Two of the side characters, Rafiki (Tshidi Manye) and Zazu (Jeffrey Kuhn) actually overshadowed the other leads were their outstanding performances. And lastly, Scar (Patrick R. Brown) was simply amazing. He reminded me a bit of Professor Snape, at times! But the costumes, masks and puppetry stole the show for me. These elements combined together to provide realistic animal characteristics and movements. Major props go out to Julie Taymor and Michael Curry for their work in making this magic happen. The sets were also first-rate, with elements re-used creatively, and innovations used to show a flowing river and the famous rescue of Simba by Mufasa. The lighting was perfect, and there were no distractions from the crew. The sound is the only area where I have any recommendations for improvement. Generally the volume was good, but adult Nala was hard to hear when she was singing. Also, there was a lot of reverb dialed into the mix for the solo singing parts, which is unusual for a musical, and distracting at times. It is a stage show, after all, not a record album and just because you have a tool does not mean you should be using it. I wholeheartedly recommend seeing the Lion King on Broadway if you are ever in the tri-state area. If you like musical theatre, it really delivers the whole package and this production comes in a close second place to my favorite show ever, Wicked. Trust me!